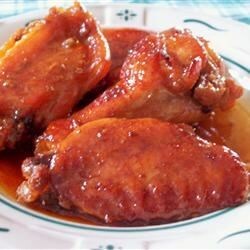 "Sweet and gooey chicken wings prepared with common ingredients, very tender." In a 9x13 inch casserole, combine soy sauce, brown sugar, oil, ginger, and garlic powder. Mix until brown sugar completely dissolves into the mixture. Place the chicken wings in the dish and turn them over until they are all well coated. Cover the dish and refrigerate for at least 4 hours. Turn the chicken again, after 2 hours. Bake chicken at 350 degrees F (175 degrees C), covered, for 45 minutes. Turn the chicken wings, and spoon sauce from the bottom of the pan over the tops of the wings. Cook an additional 50 minutes, uncovered.